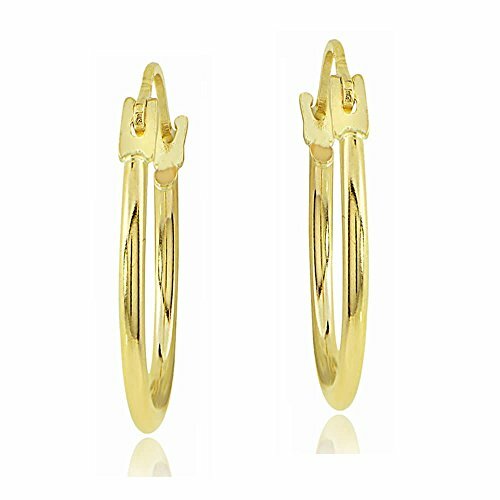 These pretty earrings feature 14k gold polished round hoops. They are 20mm in diameter. Bria Lou = "Every Day, Inspired". "Every Day" as in just that; Every Day--regardless of the time, event or occasion. From classic designs that add just the right flair & attitude to your 9 to 5 wardrobe, to stunning "one of a kind, in more ways than one" pieces that dazzle from dusk to dawn. ...And Inspired as in the subtleties and creative nuances that set our collections apart. Like the crystals with Swarovski elements used in our design accents...a quality feel that brings to mind a level of craft usually associated with pieces costing hundreds if not thousands more...our painstakingly selected gemstones, precious metals and materials--all brought together to create a flawless fusion of breathtaking style and equally impressive "substance". Now that you know what our name stands for, here's what it means..."Bria" in most languages references a celebration of life, energy and spontaneity...in short the difference between ordinary and extraordinary..."Lou" is a name associated with "creative & artistic types who excel at expressing themselves". Here's hoping you live Every Day. Inspired...courtesy of Bria Lou!